Mario Kart 8 Deluxe has had an extremely good run on the Nintendo Switch and has not had any real competition with the myriad of indie games that have tried to muscle in on its patch. MK8D may just meet it’s match though as Mario’s old adversary has returned with a racing game of his own. That’s right, Sonic is stepping up to the plate and his newest game Team Sonic Racing is going to show how racing games should be done. Okay, that may seem a little harsh but Sonic has certainly had a rollercoaster history. Sonic Mania did well to end the rut of bad games and Sonic Forces did put a dampener on the franchise again somewhat with mixed reviews. Team Sonic Racing aims to beat Mario at his own spin-offs by revamping the Sonic Racing Formula. SEGA officially announced that Team Sonic Racing will be driving its way to Swith, PS4, XBox One and Steam in Winter 2018. Developed by Sumo Digital which is no real surprise as rumours had been flying around for a while that Sumo Digital were working on a racing game for SEGA. Team Sonic Racing will feature fast-paced competitive racing with arcade elements and vehicle customization options. You can play alone, make teams with friends or go for a free-for-all race against each other. SEGA have even released a video to further officiate it’s existence. 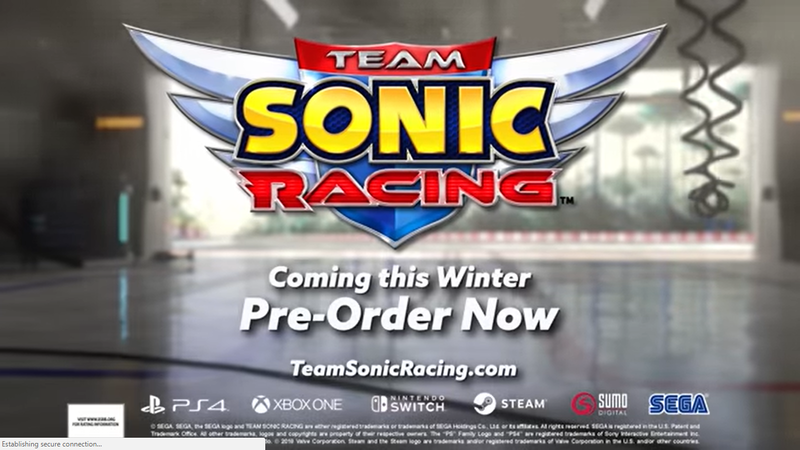 Here is the Team Sonic Racing Reveal Trailer.